NEW YORK, Dec. 3, 2018 /PRNewswire/ -- Concierge Auctions is pleased to announce that it has presented John-Mark Mitchell of Mitchell Prime Properties with its "Key To Our Success" award. Mitchell, a prominent luxury real estate broker based in North Carolina, is the first recipient of the award. Mitchell has been designated as a Diamond Agent, the highest honor within the Concierge Auctions Preferred Agent Program and is the broker in charge for North Carolina for all auctions in the state. He has also successfully participated in 12 auctions as the listing and/or buyer's agent, representing seven sellers and five buyers. Mitchell credits Concierge Auctions with helping him attract and retain luxury clientele. 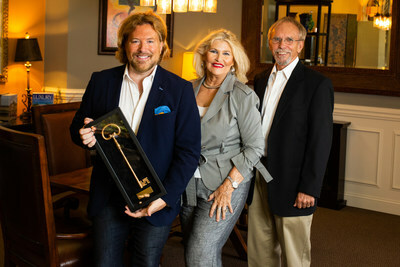 "I am so very thankful and honored to receive the first "Key to Our Success" award from Concierge Auctions," added Mitchell. "Concierge Auctions has brought national and global connections to both Mitchell Prime Properties and North Carolina and has had a direct impact on our bottom line as we are able to reach a larger amount of luxury buyers. I present the option of selling luxury properties through Concierge Auctions in my listing presentations because it's great to be able to offer them an extremely accelerated sale strategy with the latest innovations in selling real estate." Mitchell Prime Properties offers luxury real estate marketing and sales in Winston-Salem, Greensboro, Pinehurst, Lake Norman, Uwharrie, Charlotte, Wilmington and throughout the state of North Carolina. The firm is the only company in North Carolina named to the Board of Regent for Who's Who In Luxury Real Estate. John-Mark Mitchell regularly gives lectures on "The Art of Selling Well" and co-authored a book on the success strategies. He is currently at work on his second book. "John-Mark Mitchell has an incredible track record in luxury real estate, and the business acumen to embrace new ways of selling luxury properties," added Concierge Auctions President Laura Brady. "Working with him and his clients has been a rewarding experience, and we are looking forward to many future sales of luxury properties in North Carolina." Concierge Auctions has set world records for luxury real estate auctions both in Europe and the United States. The company's proven method of success focuses on an accelerated month-long sales and marketing campaign that includes direct outreach to Concierge Auctions' database of 550,000 qualified high-net-worth prospects. The process ends with a 30-day, contingency-free closing. Agents on both sides of the transaction receive full commissions. Auctions provide transparency and control to the seller who is able to see the opening bid range and all offers ahead of the auction. Concierge Auctions has achieved billions of dollars in sales volume since its founding 10 years ago. Concierge Auctions has been named to the Inc 5000 List of Fastest Growing Companies five times and was named to Inc.'s Hall of Fame. Concierge Auctions funds a home to be built for a family in need for every property the firm sells through its Key for Key® program with Giveback Homes. To learn more about working with Concierge Auctions please visit www.conciergeauctions.com or call 212.202.2940. John-Mark M. Mitchell is an Internationally recognized Luxury Broker who has marketed and Sold Multi-Million dollar estates throughout North Carolina. He has appeared on Bravo and E! and recognized as a nationally best selling author with his first book, Soul of Success, co-authored with Jack Canfield. Mitchell is the Founder and CEO of Mitchell Prime Properties, the first company to be on the cover of DuPont Registry in the publisher's history. He is also the broker in charge for Concierge Auctions for the state of North Carolina and on the Board of Directors for the Northwest Better Business Bureau. Mitchell Prime Properties markets and sells in all areas of North Carolina and has recently opened an additional office to grow market share in the Lake Norman and Charlotte areas. They are also expanding with an office in Wilmington and the Crystal Coast area. John-Mark serves on the Board of Regents for Who's Who in Luxury Real Estate International and has been featured in Fortune Magazine as a GameChanger in 2016. Concierge Auctions is the largest luxury real estate marketplace in the world, powered by state-of-the-art technology. Since its inception in 2008, the firm has generated nearly $2 billion in sales, broken world records for the highest priced homes ever achieved at auction, and is active in 38 U.S. states/territories and 20 countries. Concierge curates the most prestigious properties globally, matches them with qualified buyers, and facilitates transparent, market-driven transactions in an expedited timeframe. The firm owns arguably the most comprehensive and intelligent database of high-net-worth buyers and sellers in the industry. It has been named one of America's fastest-growing companies by Inc. Magazine for the past five consecutive years, and has contributed over 100 homes to-date as part of its Key for Key® giving program in partnership with Giveback Homes, which guarantees that for every property the company sells, a new home will be built for a family in need. For more information visit conciergeauctions.com.